Hello there, all beach volleyball players & fans! Hietsu Beach Volley Club (HBV) official language is Finnish, but you are very welcome to join the club, our games and other activities in English as well. This page provides you with the most important information about us. Please read it carefully. Hietsu Beach Volley Club was founded in 1995, and the number of members has grown every year since. 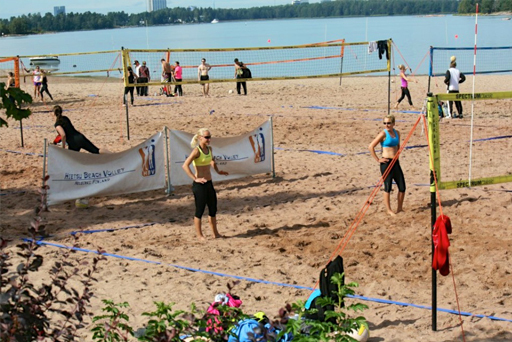 Today, we have more than 700 active members taking part in HBV activities: free play using the HBV quality gear, weekly games for men and women (king of the beach -style with our own ranking system), HBV championship tournaments and other member tournaments, organised training sessions with pro teachers, beach parties and sauna evenings. We train and play at the biggest and (naturally) best beach in Helsinki, Hietaranta aka “Hietsu”. Hietsu is within an easy walk from Helsinki city centre (approx. 2 km). When snow takes over the beach, many of the HBV members move their games to the 3-court indoor beachvolley hall Biitsi.fi Areena (http://areena.biitsi.fi/). Biitsi.fi Areena is conveniently located close to our home beach as well as the city centre in Ruoholahti, just a 2 min’s metro ride from Central Railway Station. To pay and register as a new member, click here. The membership fee for 2019 is 60 euros. For junior members (18 years) the membership fee is 20 euros. Once you’re registered and paid up, you’ll get to use all the club gear: balls, nets, ropes…all you need to get a game going. Please note that all the players on a court must be members. Weather permitting, there are always players to be found on the beach, but you are certain to find a crowd on sunny afternoons to evenings in May to September. The official HBV games are played on Tuesdays (ladies’ “Tirsat”) and Wednesdays (gents’ “Keskarit”), starting at 18:00. During the season, most Thursday evenings we’ll have guided training sessions for members at 18:00-19:00, led by the more experienced players. Sign-up for the games and training sessions happens at the latest 17:45, so get there early. Thursday training sessions accommodate a limited number of participants. Follow our events calendar to keep track of what’s happening. Join the games or come watch! Note that free nets will be hard to come by on Tuesday, Wednesday and Thursday evenings during the games and training session. Sign up for our member newsletter at the bottom of the page (tilaa uutiskirje) to receive the latest news in brief. See you on the sands of Hietsu!